Venetian gilt and enamelled glass was an expensive and relatively rare commodity often separately listed in the owner's inventory or account books. 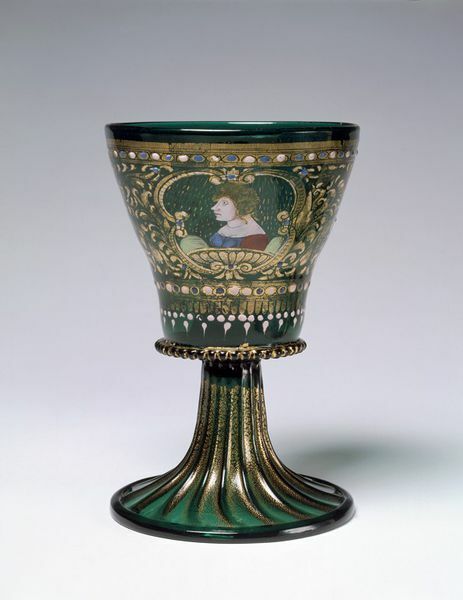 This highly decorated goblet shows the profile portraits of a man and a woman. Although no specific contemporary references to their particular purpose is known, glasses of this type have usually been understood as gifts relating to courtship and marriage. Marriage was certainly a major event in the life-cycle of Renaissance citizens, and a period during which huge expenses were made for luxury household goods. The glassmakers of Venice had an excellent and wide spread reputation for high-quality glass and fine workmanship in gilding and enamelling. This goblet is an exceptionally fine example of their work. Luxury goblets like this had an important function in showing off the wealth and refinement of the owner and would have been used only at rare and special occasions. Even at high-society wedding banquets, the guests would have drunk from simple, colourless glass beakers, but due to their fragility almost none of these have survived. Two part goblet, consisting of a trumpet-shaped foot, blown in a dip-mould with 16 ribs and a upwards folded rim. The foot is decorated with a single sheet of leaf-gold which was applied during the process of blowing. It is crackled through further expansion subsequent to its application. The pattern of cracks fissures is more dense, but finer and even, towards the lower part of the foot. The fissures are slightly wider in between the ribs and the gilding has worn on top of the ribs. Underneath in the inside of the foot, is a rough pontil mark, with some glass stuck to the inner side of the foot. It is not possible to detect evidence of a second application to the pontil for firing of the enamels. Around the base of the bowl a glass thread has been added, with applied leaf-gold. It is indented with a sharp instrument at regular intervals to form a gadroon pattern. The decoration of the bowl in scratched leaf-gold and enamel is divided in horizontal bands. The wide central frieze shows two cartouches at either side, separated by foliage. Within the cartouches in profile portraits of a man (facing right) and woman (facing left) under a shower of sun rays. Each portrait is flanked by two hills, painted in green enamel with black hatching. The faces are painted with details outlined in black and shades and the lips rendered in pink enamel. The hair is gold with fine scratched details. The man wears a white hat with black hatching, a blue coat with a red collar, also with black hatching and details. The woman wears a blue dress with red arms, both with black hatching. On top of the gilding of cartouches and foliage are a few blue enamel dots and highlights in white enamel. Above and underneath the central frieze are bands of leaf-gold, scratched with horizontal lines and a row of small circles. Within each circle is there is a dot alternately in blue or white enamel. The lower band of the gilding ends underneath with a row of scratched dents. Below there is a row of white enamel dots, followed by another row of white dots, which have been pulled down with brush or stick, to form small tails. The leaf-gold on the bowl has been applied in several sheets. The sheets must have been long enough to cover the decorated area of the bowl from top to bottom, as al the lines formed by overlapping sheets of gold, are running vertically. There is hardly any crackle due to expansion of the glass after application of the gold leaf, except for the area directly underneath the rim, which has slight fissures. This indicated that the leaf has been applied after annealing, just before the enamel was applied. In the second firing the diameter around the rim has increased slightly, causing the leaf-gold to crack. There is a small smudge of red paint on the rim, fused within the glass during firing. There are also a few specks of gold (paint?) on the inside of the bowl. Historical significance: The glassmakers of Venice had an excellent and wide spread reputation for high-quality glass and fine workmanship in gilding and enamelling. This goblet is an exceptionally fine example of their work. Luxury goblets like this had an important function in showing off the wealth and refinement of the owner and would have been used only at rare and special occasions. Even at high-society wedding banquets, the guests would have drunk from simple, colourless glass beakers, but due to their fragility almost none of these have survived. 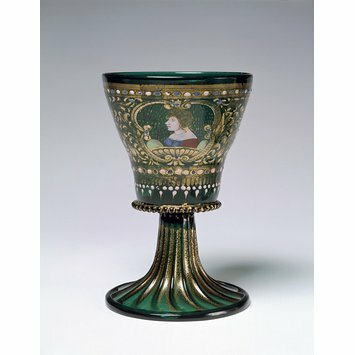 Goblet, green glass, enamelled with arabesque scroll work in gold and colours, with profile portraits of a lady and a gentleman in medallions. Italian (Venice), 1475-1525. J.A Brooks, 'Glass' London 1975.